In 2011, Intel and AMD both launched native SATA3 supported chipset. 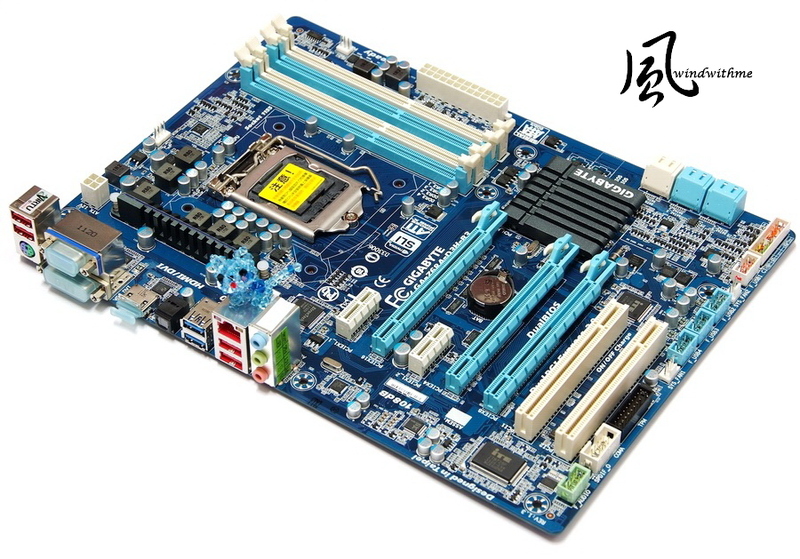 SATA3 strength is 6Gb/s bandwidth that is double of SATA2. 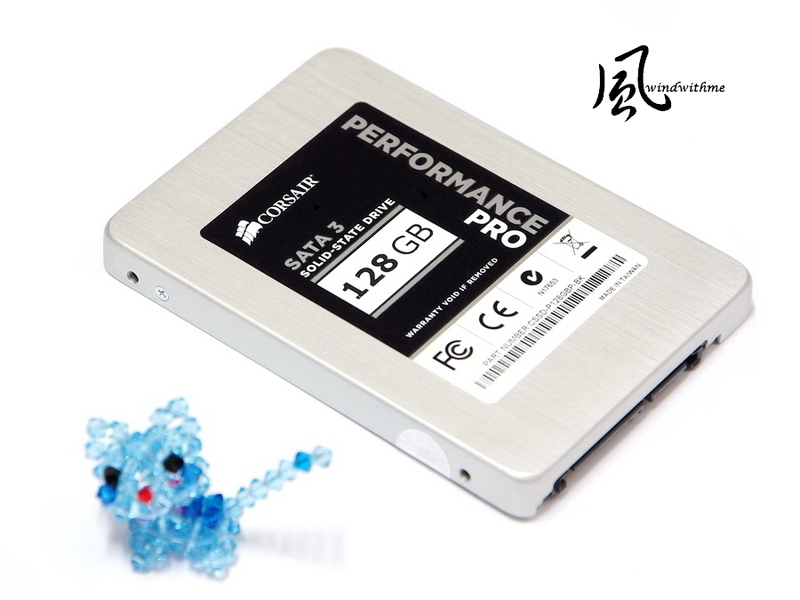 It brings Solid-State Hard Drive performance into new competition stage. 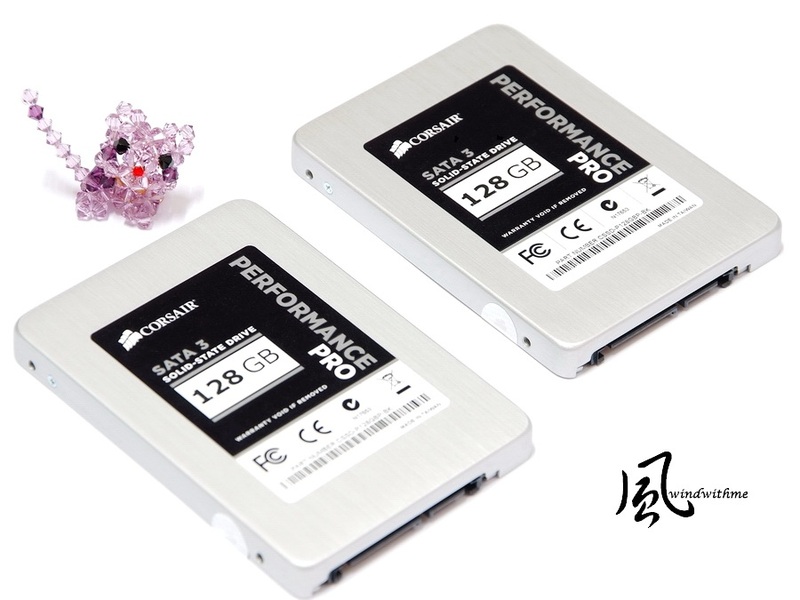 SSD performance is combination of controller chip and NAND FLASH. NAND FLASH also divides into SLC and MLC. Now the mainstream market is MLC. Nowadays, MLC performance is not much different with SLC. MLC writing life cycle is also improved by new algorithm technology. Of course, MLC market price is much lower than SLC, the future trend still go this way. Last year, best SATA3 controllers were SanForce and Marvell. Intel 510 Series SSD also used Marvell. 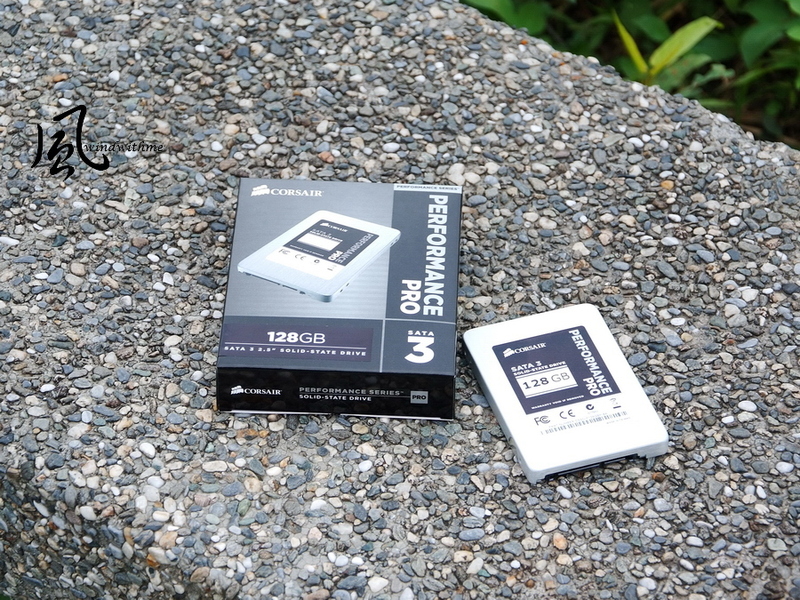 This SSD is from CORSAIR latest series - Performance Pro Series. It’s different naming with former Performance 3 Series, but the packing seems belong to same product line. Upper right is Performance Pro 128GB. Lower is 3.5” adapter and screws. It’s 2.5 inches and 128GB capacity. Max Sequential Read/Write official spec, using ATTO Disk Benchmark, is 500/340 MB/s. 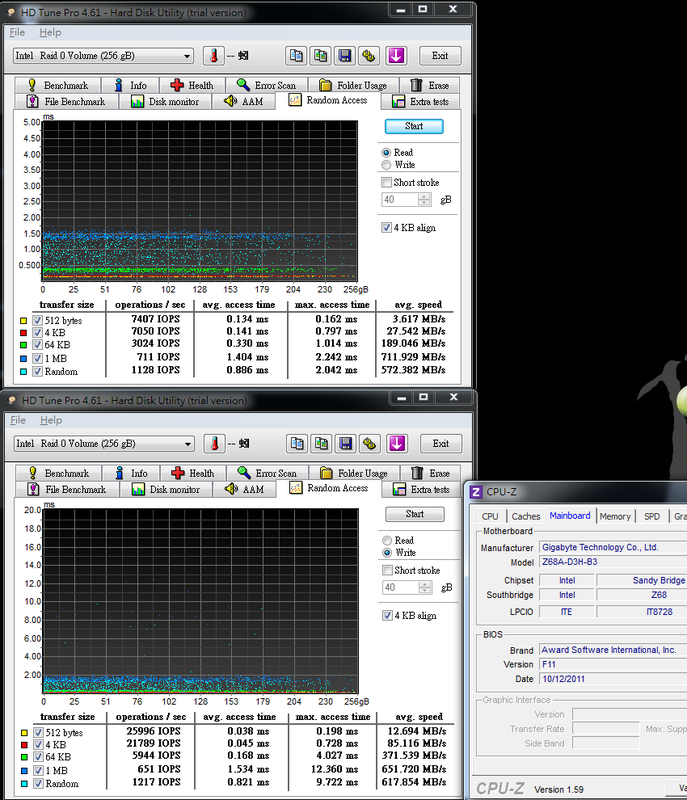 Random 4K max writing performance is 60000 IOPS. It’s very high spec in SSD market now. The shell is silver coated with brushed finish. The texture is similar to sleek metal. CORSAIR provides 3 years warranty. It has 128GB and 256GB. I hope they can provide 564GB in the future for more options. Backside material and tone are same as front. You can see 2 silver laser stickers in lower right and left. It’s for warranty and internal hardware protection. I suggest you to keep it as origin. This is SATA3 and power connectors. It’s same as SATA2. 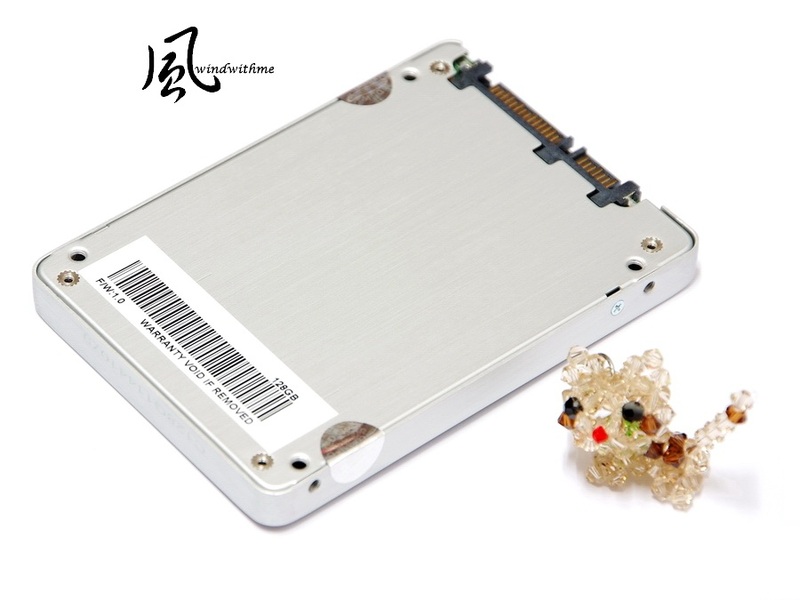 Users need to distinguish SATA3 by packing or spec sticker. 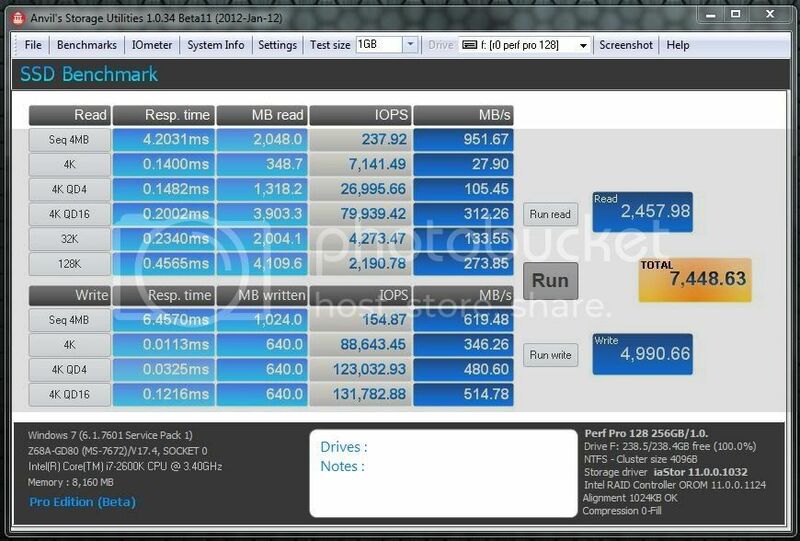 Performance Pro uses Marvell 88SS9174-BKK2 controller. NAND FLASH is TOSHIBA 34nm, 16GB per chip. DRAM Cache is NANYA DDR3 256MB. So far, I only see PLEXTOR SSD using this combination and it’s been launched for months. 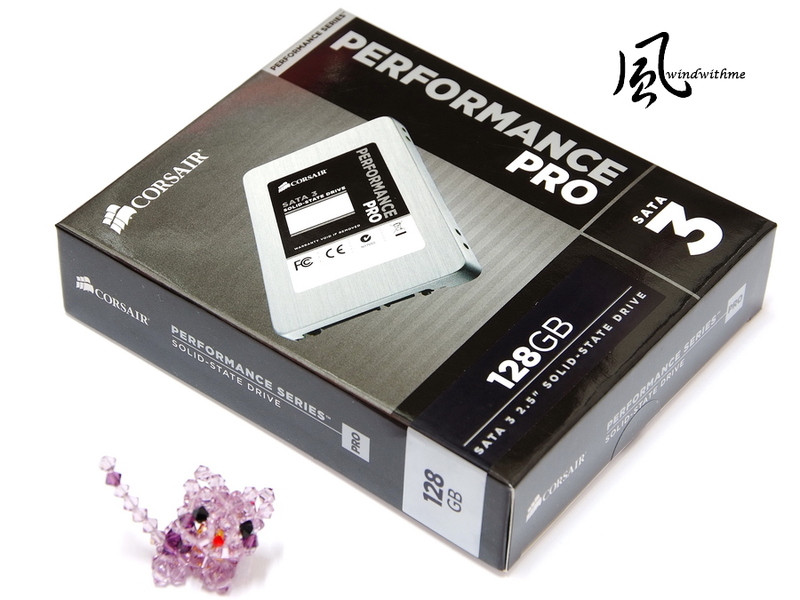 In Nov, CORSAIR launched Performance Pro. The performance should be the most average one. First of all, Intel DeskTop platform uses GIGABYTE Z68A-D3H-B3 supports Raid 0. It’s with 3 PCI-E X16, 2 PCI-E X1 and 2 PCI. It’s good expandability in ATX platform. Z68 also supports GPU output. It supports 3 output interfaces and blue one is USB 3.0 port. 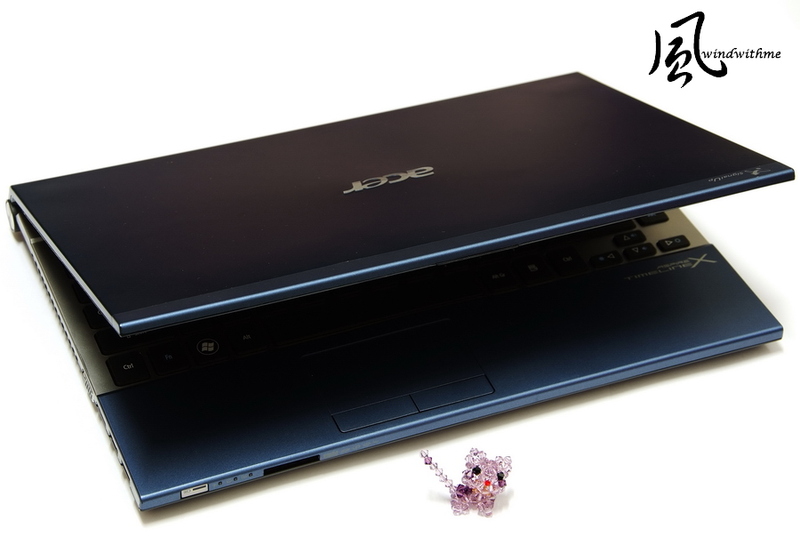 Z68 exclusive Intel Smart Response Technology supports small capacity SSD and HDD making hybrid speed up. Intel Z68 chipset is mid-high segment product. It’s easy to find in the market. In the past 6 months, MB tough competition made Z68 entry model price is more parity and reasonable. P67 and H67 position and price are not good as H61 and Z68, they are almost fade out from the market. Non OS drive and empty data. HD Tune Pro Read and Write are quite steady. 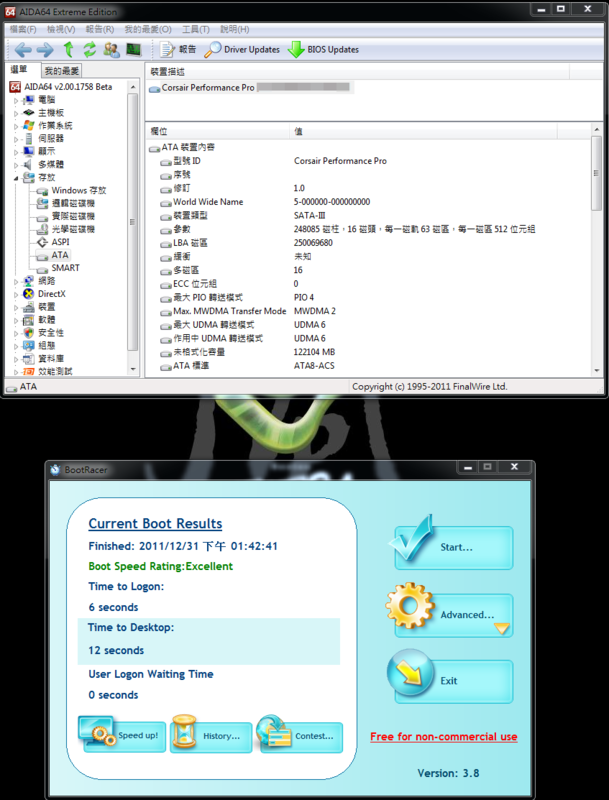 Access Time is 0.28~0.35ms which helps for performance. File Benchmark over 1024k read is over 450 MB/s. 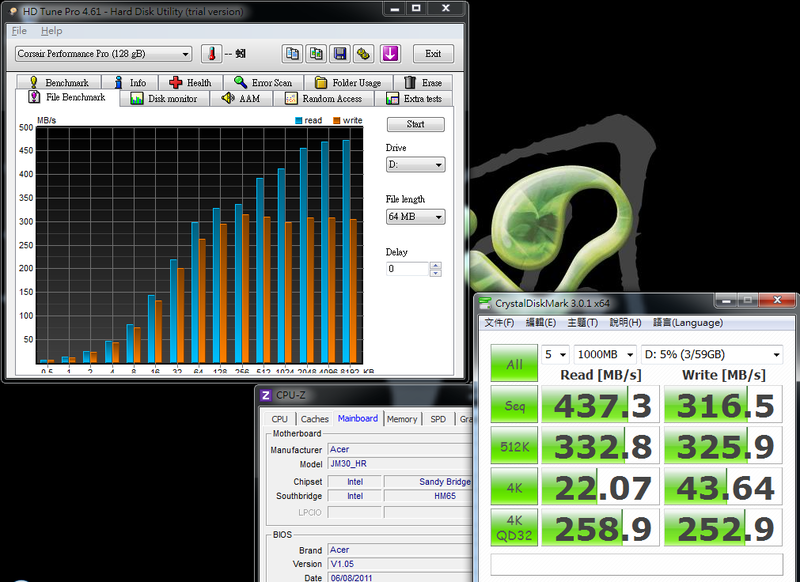 ATTO DISK Benchmark max read is 506.4 Mb/s and write is 340.1 MB/s. 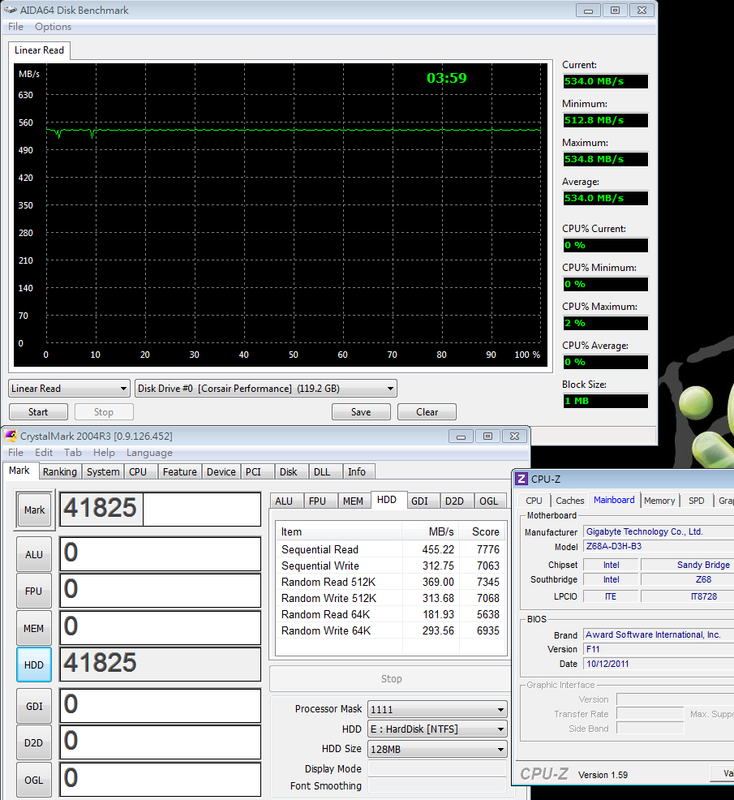 ATTO DISK Benchmark reaches official spec, 500MB/s read and 340 MB/s write. 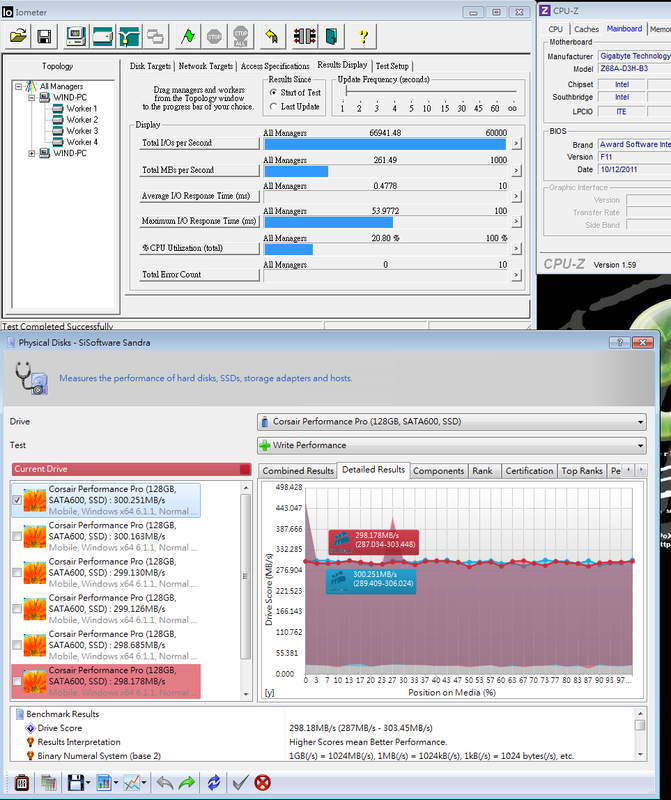 CrystalDiskMark 3 modes performance are similar. Marvell 88SS9174-BKK2 controller stability is excellent. As SanForce controller uses special algorithm, the performance only improve at <All 0xFF, 1Fill> and <All 0x00, 0Fill>. 4K is not as good as SandForce SF-2281 controller. However, Seq Write and 4K-64Thrd transferring are excellent. The score is 865. 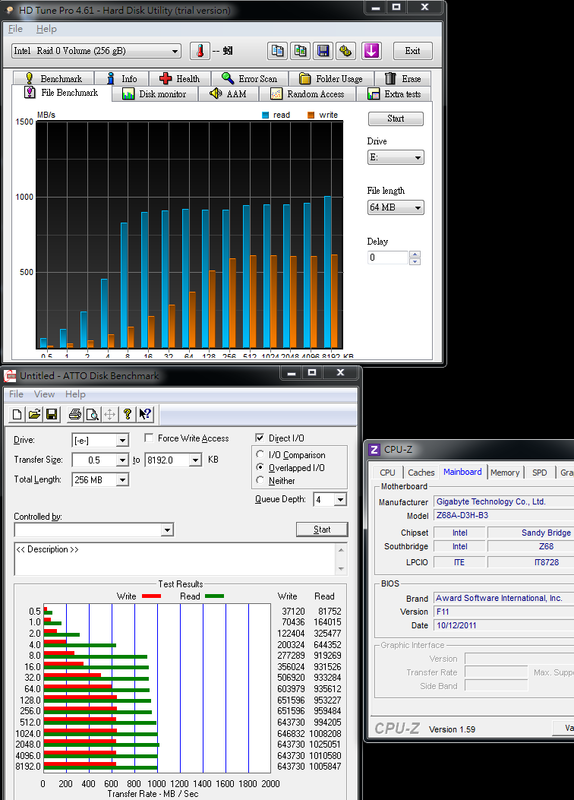 IOMETER 2008 test 100% Random 4k Write also achieves 67K IOPS. 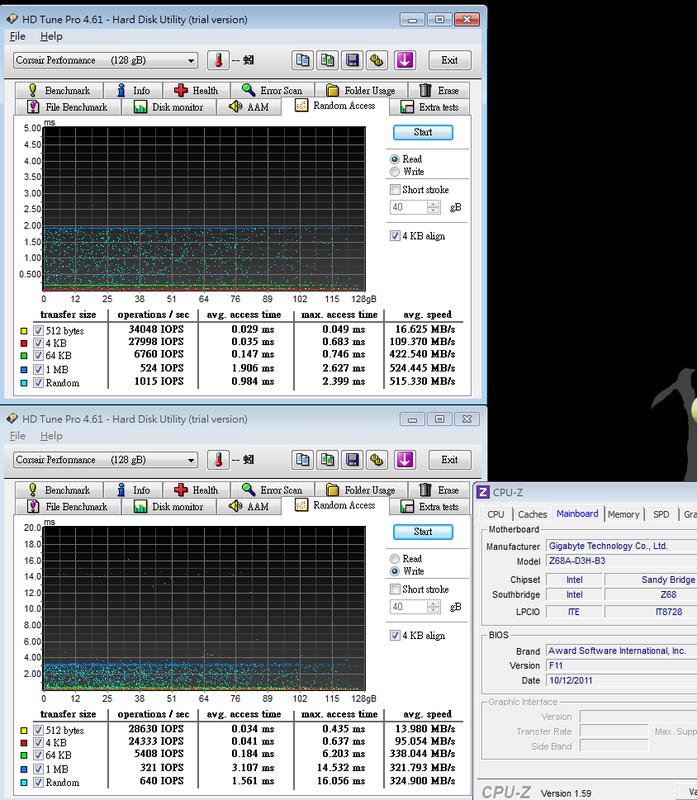 This part only loses SanForce 85K IOPS. It’s 2nd best performance so far. 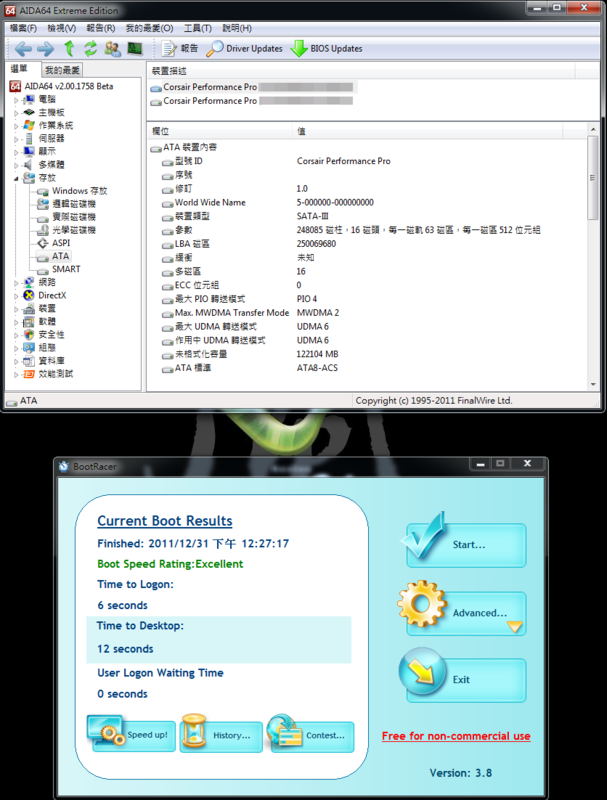 Performance Pro 128GB installs Windows7 Ultimate 64bit to test booting time. LAN chip is not installed. The other drivers and Intel Smart Response Technology are installed. After entering OS desktop, LAN will search for a while, it takes 2~3 more seconds after installing LAN drivers. Performance Pro booting speed is very impressive. It takes only 12 seconds under all drivers installed condition. Of course, after you install more daemons, the booting speed will be slower. This number is for a reference. 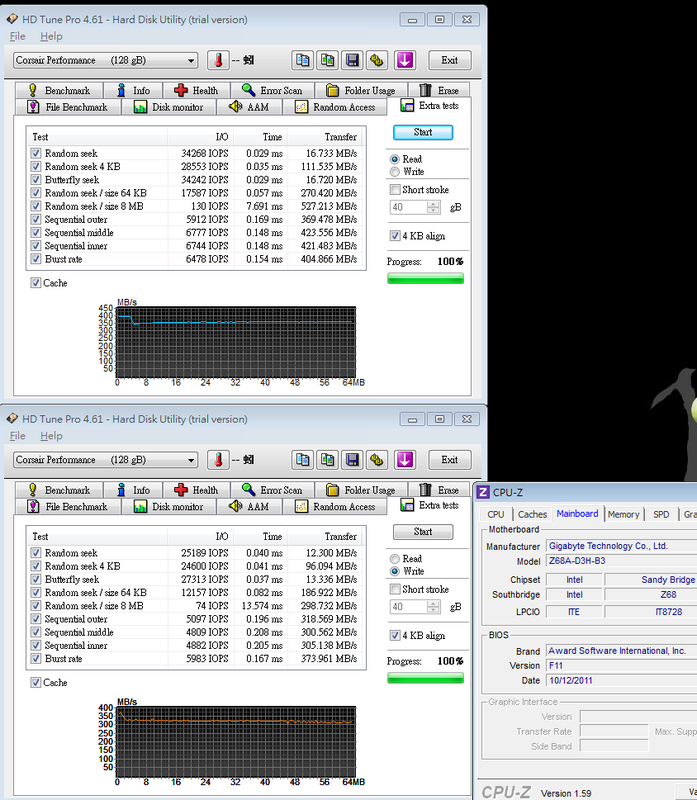 2nd part is using two 128GB for Raid 0 mode. 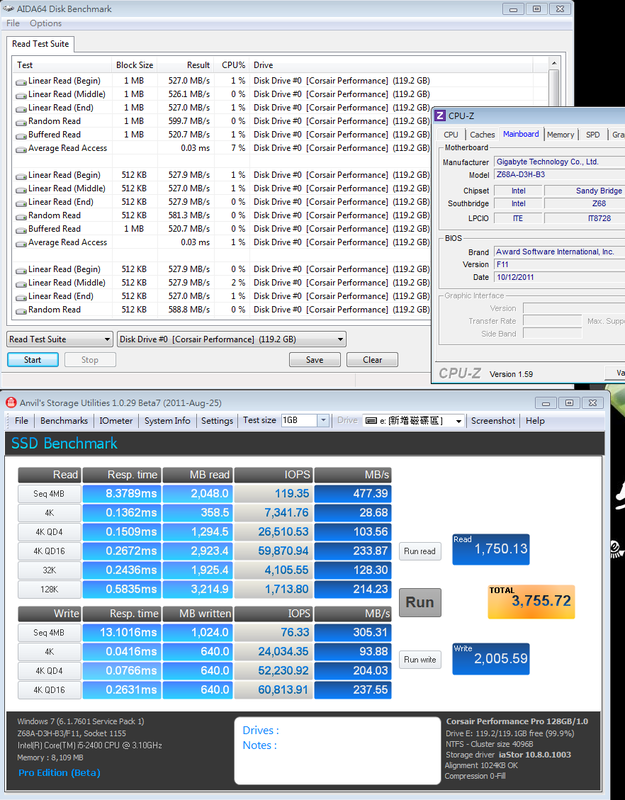 As Raid 0 experience, Intel chipset has better performance in Raid0 mode. 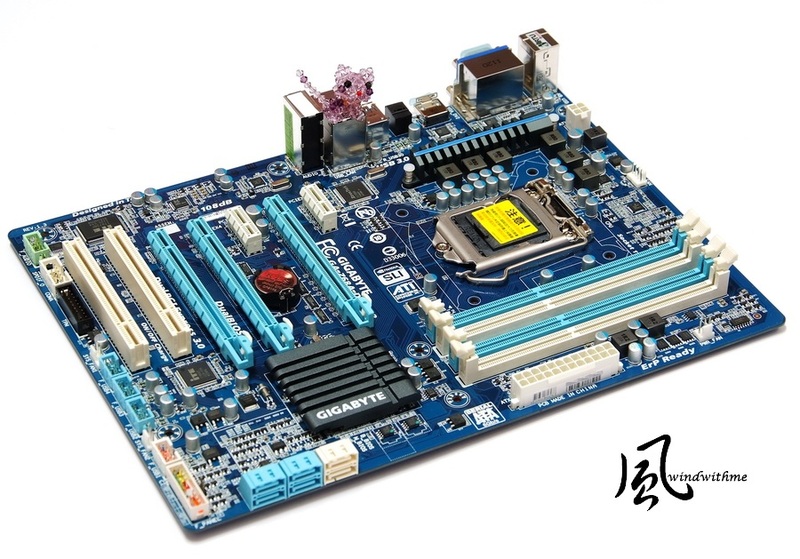 The mainstream is LGA 1155 Z68 or LGA 2011 X79 platforms. 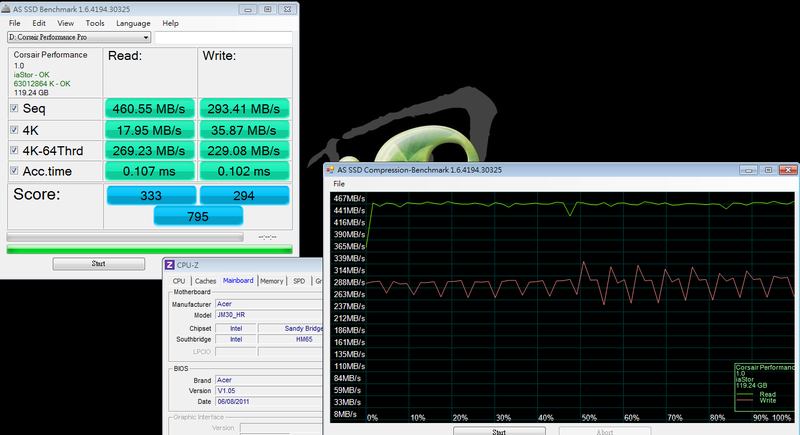 Two CORSAIR Performance Pro Series 128GB install at white SATA3. File Benchmark over 256k read is over 900 MB/s. 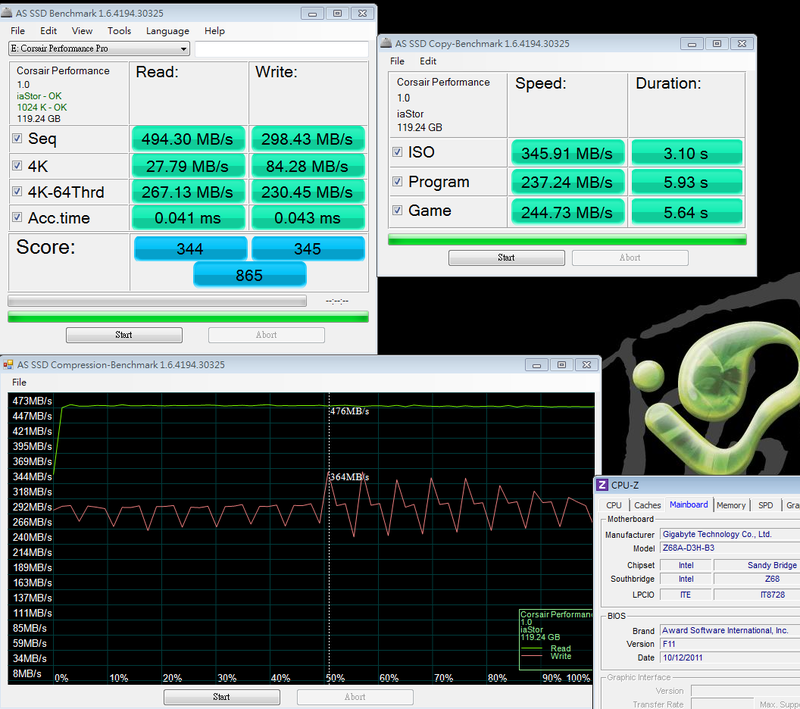 ATTO DISK Benchmark achieves read 1025 Mb/s and write 651.5 MB/s. 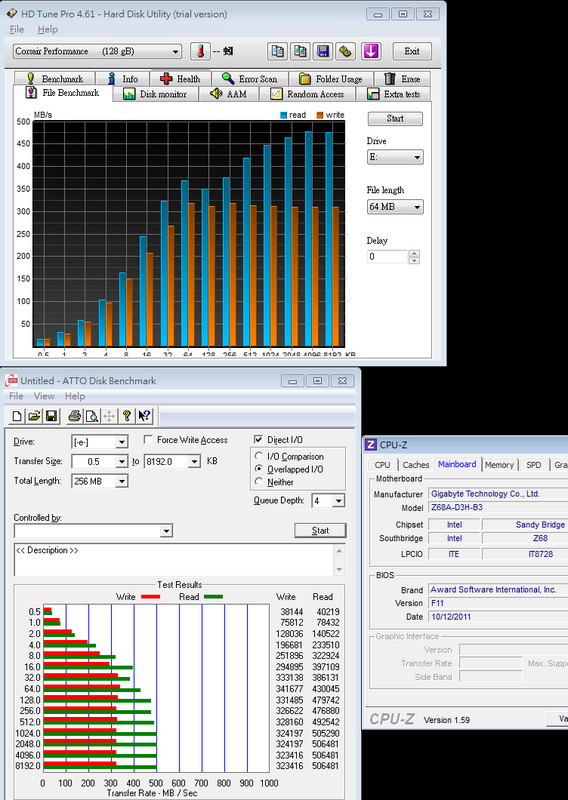 ATTO DISK Benchmark can test SSD best read/write performance and doesn’t take long test time. This part is almost double the official spec. It really shows Raid 0 max performance. ADIA64 Linear Read test appears unexpected acceleration sometimes. Every 5 times test cycle, 1 or 2 times will appear extreme high bandwidth. Average performance is around 9xxMB/s. 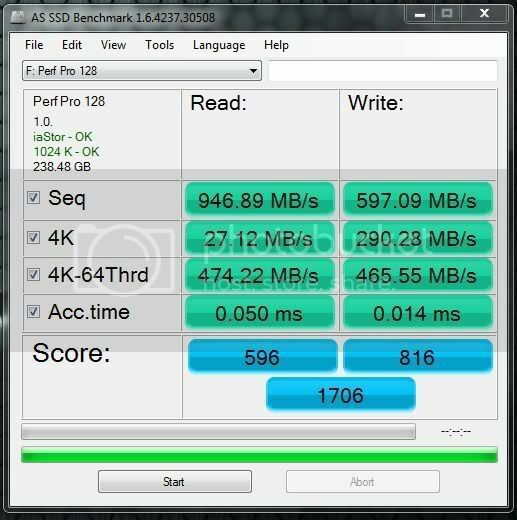 AS SSD Benchmark performance is not double but several items and total score are over 1.9 times more. 100% Random 4k Write reaches 122K IOPS. It’s helpful for small files processing. SiSoftware Sandra Write is also steady. The average is around 600 MB/s. Installing all hardware drivers and Intel Smart Response Technology. The booting speed doesn’t improve. 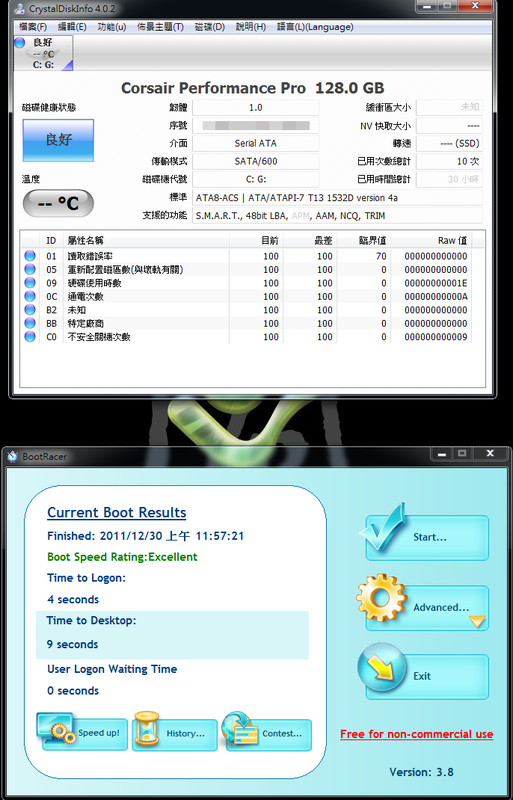 It may be caused by clean system can be handled by single SSD already. If I get the chance, I will install more software and compare the booting speed again. SSD cannot support TRIM mode in Raid 0. It’s waiting Intel to provide new Raid TRIM software in the future. Performance Pro web page shows the background garbage collection can support TRIM command to solve performance drooping issue in Raid mode. It needs to be approved after long time usage. Anyway, it’s a great news for SSD Raid users. 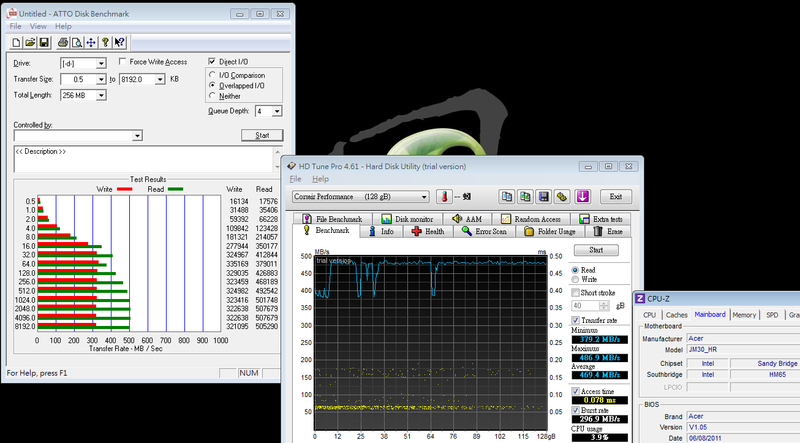 Finally, I use NoteBook to test performance. Due to NoteBook Raid 0 supported models are over 16 ~17 inches , after consideration, I choose acer TimelineX 3830TG for single SSD performance test. 3830TG color is very eye catching. The upper cover is aluminum. It’s also slim design. 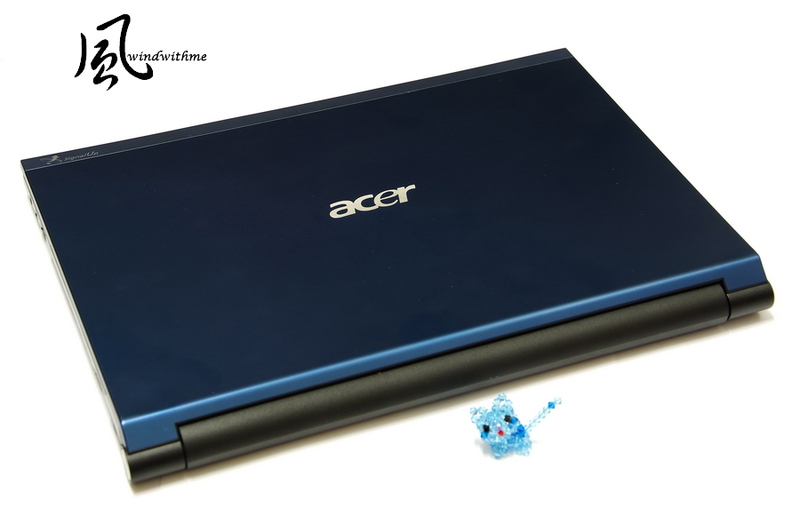 It is built-in individual graphics and 6Cell battery. The price is very affordable. No doubt it’s hot selling model. 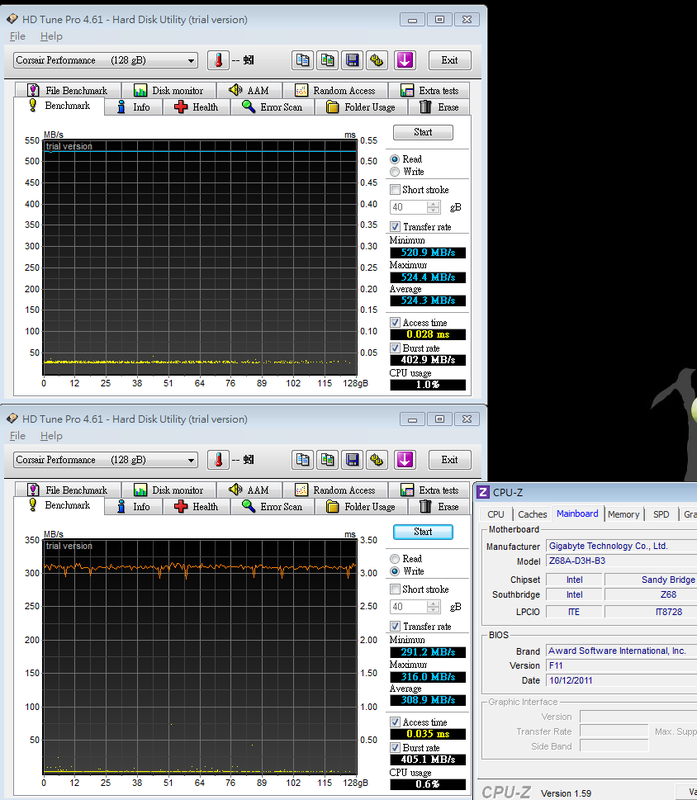 CORSAIR Performance Pro Series 128GB install in SATA3 as system drive. 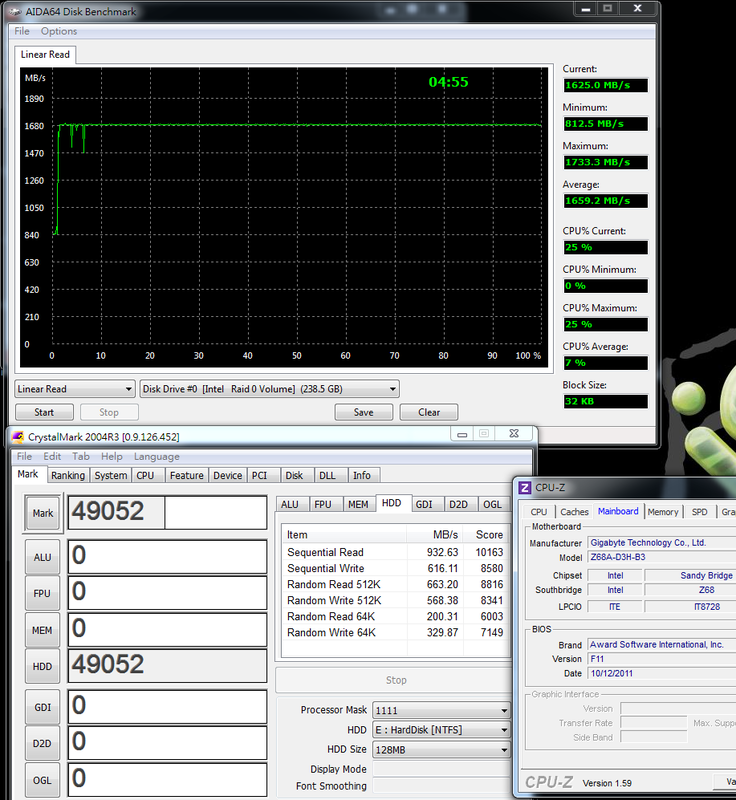 ATTO DISK Benchmark max read is 507.6 Mb/s and write is 335.1 MB/s. File Benchmark over 2048k read test is over 450 MB/s. 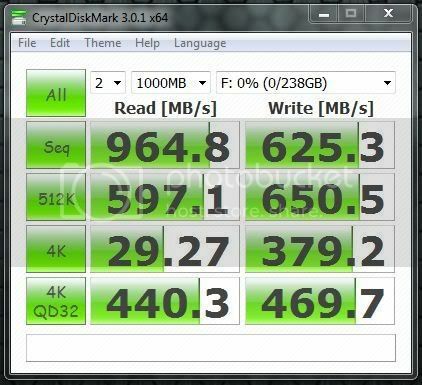 NoteBook SATA transfer rate is a little bit slower than DeskTop, especially in 4K. 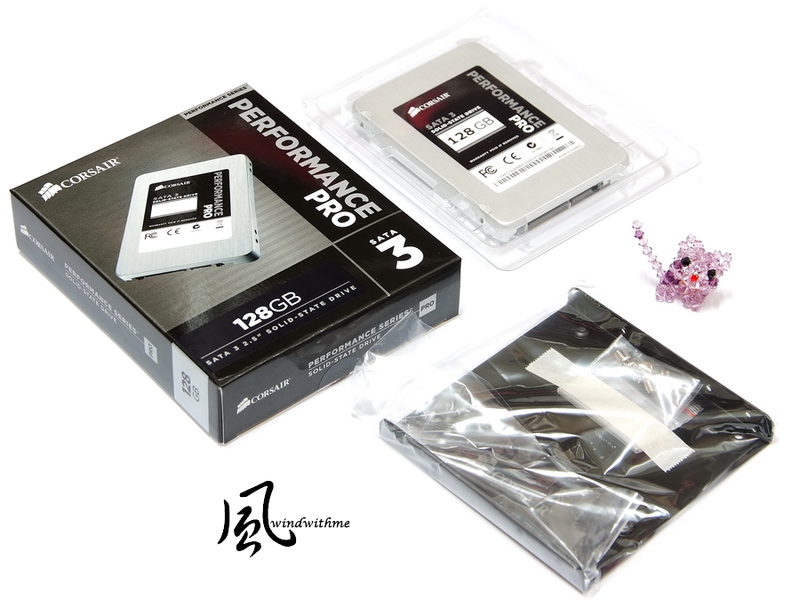 However, in 3830TG SATA3 transfer rate, the performance is still acceptable. Booting speed compares with former shared SSD and HDD reviews. TOSHIBA MK6461GSY 640GB 7200 time to Desktop is 42 seconds. CORSAIR Force GT 120GB(SandForce SF-2281) time to Desktop is 16 seconds. 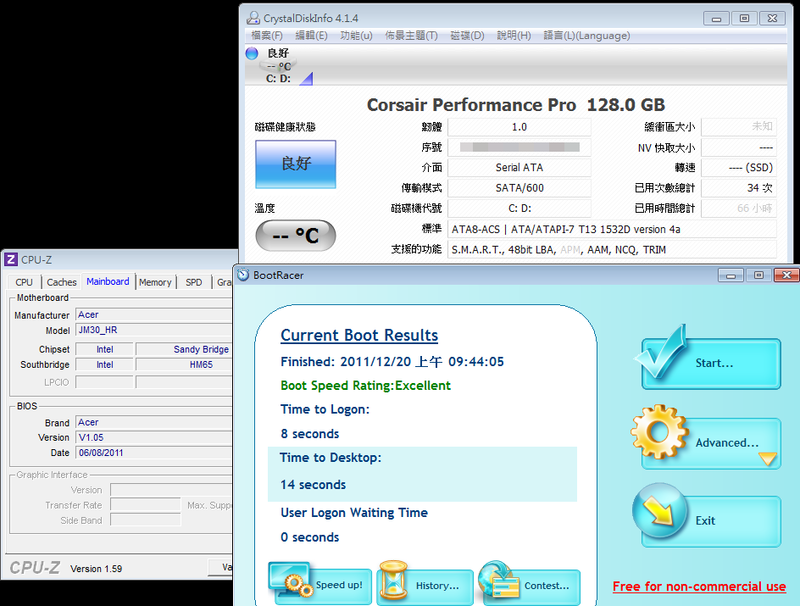 CORSAIR Performance Pro 128GB(Marvell 88SS9174) time to Desktop is 14 seconds. 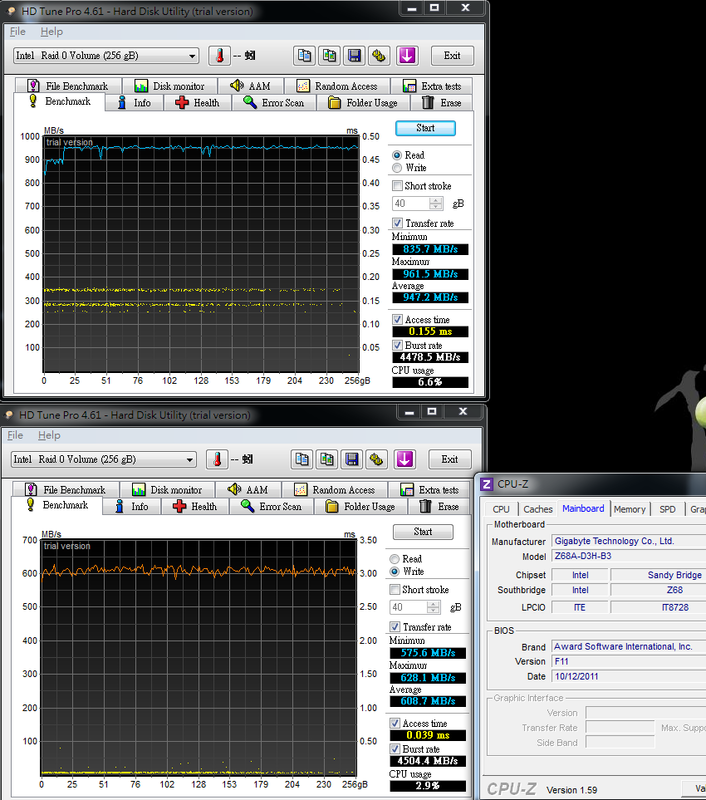 It’s all test in same NoteBook and installed same drivers and software. 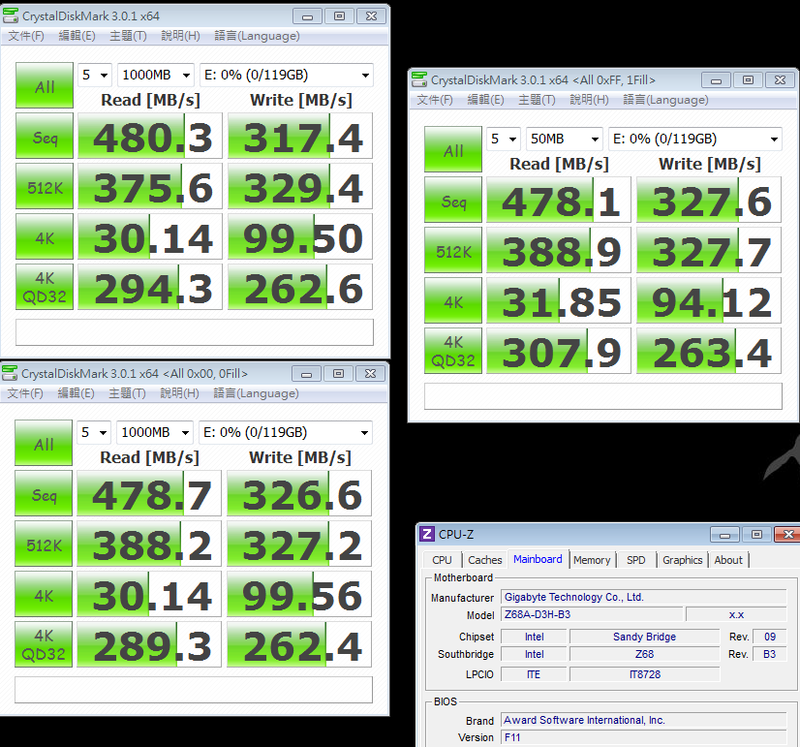 Two SSD are much faster than HDD. Performance Pro is even faster than Force GT. Normally, SSD key performance role is controller. This SSD also shows the importance of NAND FLASH. 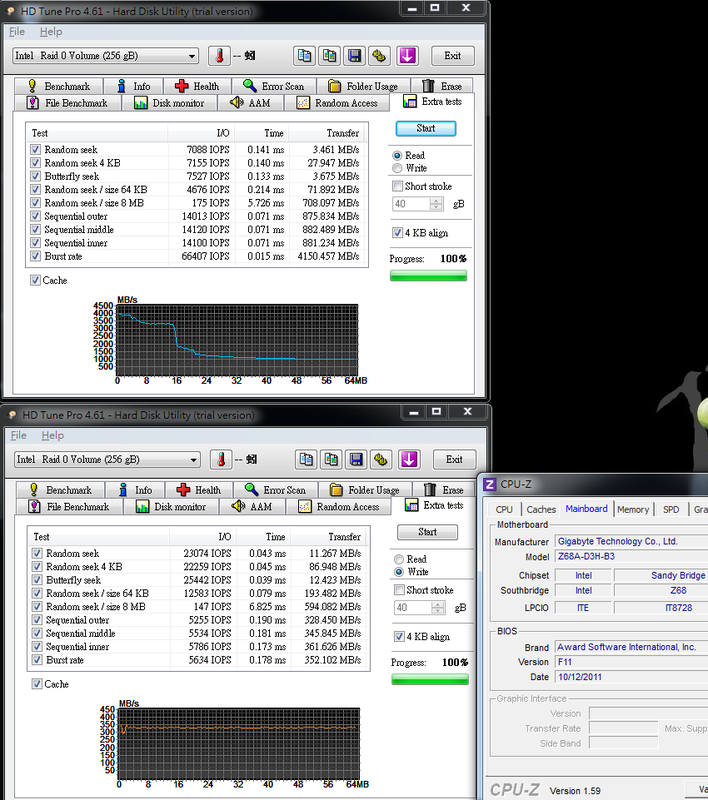 Read is 450 MB/s, Write is 210 MB/s and 4K Write is 14000 IOPS. 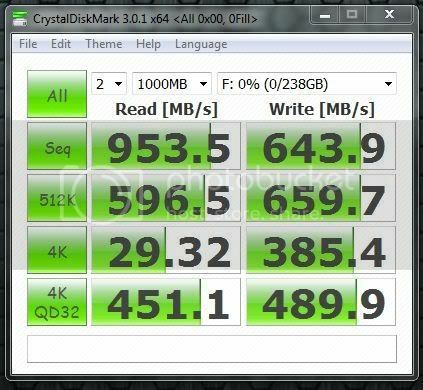 CORSAIR Performance Pro uses same Marvell 88SS9174 but NAND FLASH changes to TOSHIBA. 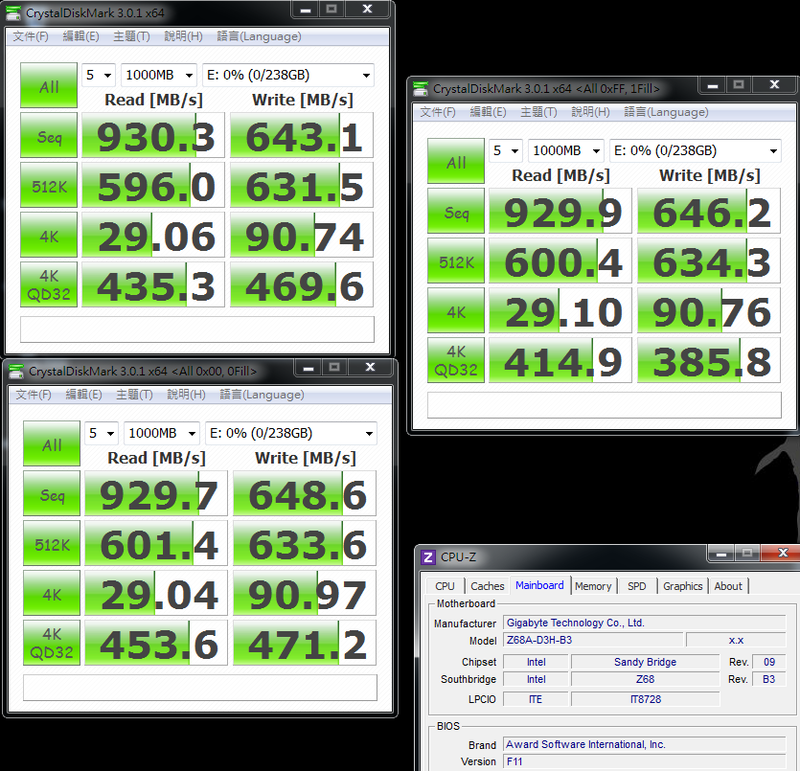 The spec change to 500MB/s read, 340MB/s write and 60000 IOPS 4K write. You can see no matter read/write performance is improved. Even 4K write also improves 2~4 times. It’s really excellent performance. 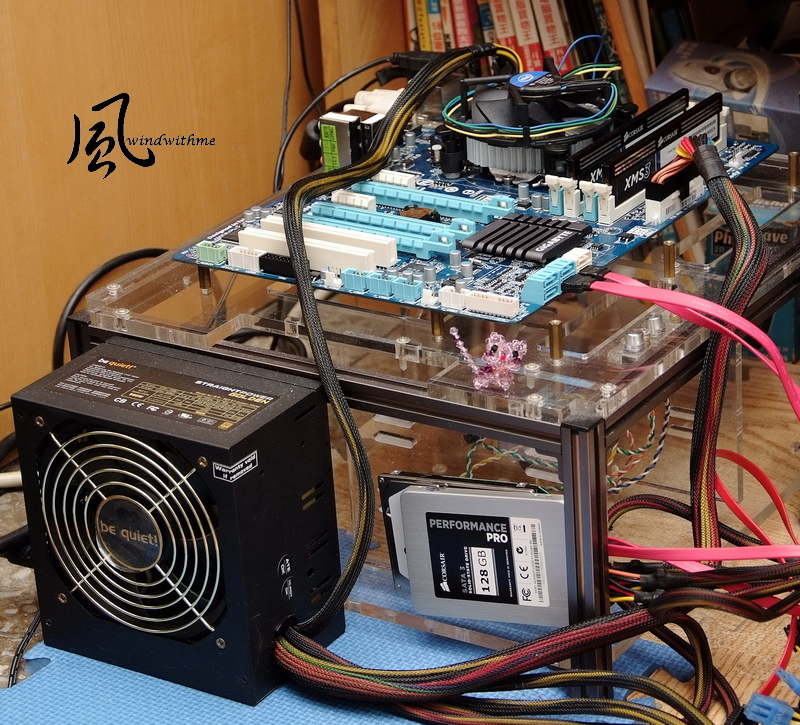 Native SATA3 has been launched a year. The SSD performance is breakthrough. 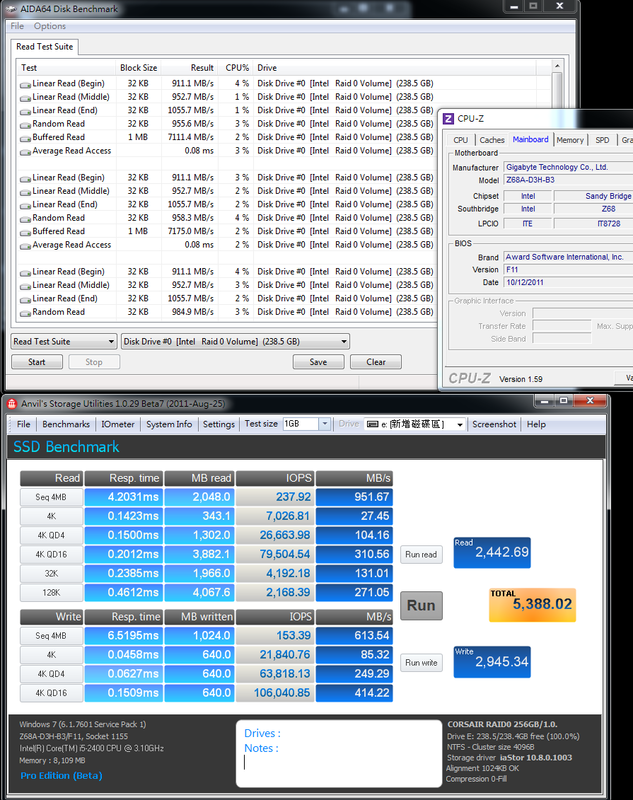 SSD Read/write performance is over 400~550 MB/s and 4K performance is over double as SATA2 stage. 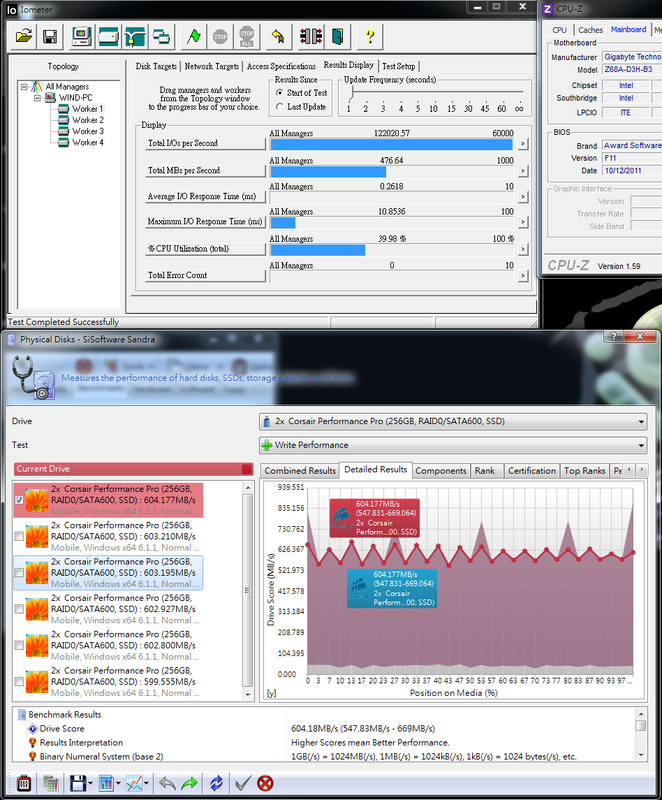 Performance Pro built-in advanced garbage collection solves Raid mode performance dropping after long time used. CORSAIR SSD product line has SandForce SF-2281 with Force GT and Marvell 88SS9174 with Performance Pro. They are both highest performance controller so far. After combining high performance synchronized NAND FLASH, the transfer rate is even higher. As SSD brands tough competition stage, besides SSD performance, users also need to consider brand awareness, warranty, price and stability. Windwithme share this latest technology SSD as your reference guide.